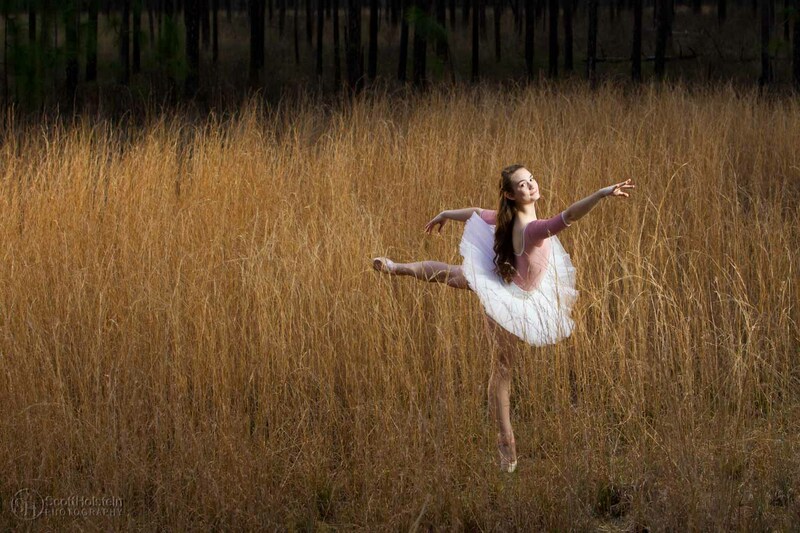 Creative image of a ballerina striking an arabesque en pointe in a field in Tallahassee, Florida. Creative photography of an adventurous ballerina in a black tutu striking an attitude while sitting in a dead tree on location near Tallahassee, Florida. Photo of a ballerina en pointe on a canopy road in Florida by Tallahassee photographer Scott Holstein. Corporate portrait photography of a small business Sharon Davis School of Dance’s staff on a white background in Tallahassee, Florida. Photo of a ballerina in a pink tutu in cambre on a white background by Tallahassee dance photographer Scott Holstein. Photo of a seated, young ballerina in a pink tutu on a white background by Tallahassee portrait photographer Scott Holstein. Commercial photography for advertising and marketing campaigns for Sharon Davis School of Dance in Tallahassee, Florida. The images were used for studio decor, print advertisements in newspapers and magazines, and marketing, including their website and social media. I suggested including some environmental images that featured Tallahassee's natural beauty. The client was on board so I conceptualized the images, scouted the locations, and brought the images to fruition. For the studio portraits, I set up my location studio at the dance studio. The dancers were then able to pose in the familiar space.